Microsoft has announced that minimum hardware specification system requirements for Windows 10 which are necessary to boot, run, update and service Windows 10. The Windows 10 minimum hardware requirements provide a baseline user experience that is comparable with similar devices and computers. As it’s basic requirements, chance is that if you’re running Windows Vista or Windows 7, or even Windows XP, probably your system will support the upgrade to Windows 10. But if you want to enjoy Windows 10 with best user experience, it’s understandably to have hardware that is better than minimally required. The information on Windows 10 system requirements were revealed during the “Minimum System HW Requirements & Compatibility for Windows Platforms” event during WinHEC Shenzhen 2015, which was intended for OEMs, ODMs and IDHs who design devices of various form factors from small, lost cost devices to high end gaming PCs. The slide detailed the Windows 10 system requirements was posted online, offering insights into hardware specifications required by Windows 10. Windows 10 has a unified core but different releases for different kind of devices, such as computer, tablet and phone. Thus, the minimum hardware requirements very much depends on where you plan to run Windows 10. Do also note that if you’re only intending to upgrade your current Windows 7, Windows 8, Windows 8.1 or older systems to Windows 10, you probably can ignore requirements on optional hardware components such as sensors and etc. Screen size between 3 to 7.99 inches. Firmware supporting UEFI 2.3.1 with Secure Boot enabled. More than 4GB of flash storage space (at the bare minimum of 4GB disk space, a SD card is required to support updates). Graphics card supporting DirectX 9. Power, Volume Up, Volume Down buttons, and Start, Back, Search buttons for phones with WVGA display. Trusted Platform Module (TPM) enabled. If the Windows 10 is installed on a smartphone, of course, some standard components that one would expect on the phone is required, such as cellular radio, speaker, earpieces, headphone or headset jack connector, 802.11b/g wireless, 2-finger multitouch with HID-compliant, vibration mechanism for notification, various sensors such as accelerometer, magnetometer, ALS, proximity, gyroscope and etc is required. Depending of the form factors, some of these components are optional. RAM: 2GB memory for 64-bit Windows 10 and 1GB memory for 32-bit Windows 10. Display: 1024×600 at minimum screen resolution of 800 x 600 pixels. Graphics card supporting DirectX 9 or later with WDDM 1.0 driver. Tablet and hybrid devices must have Power, Volume Up and Volume Down buttons. Trusted Platform Module (TPM) 2.0 enabled 1 year after RTM, optional before that. 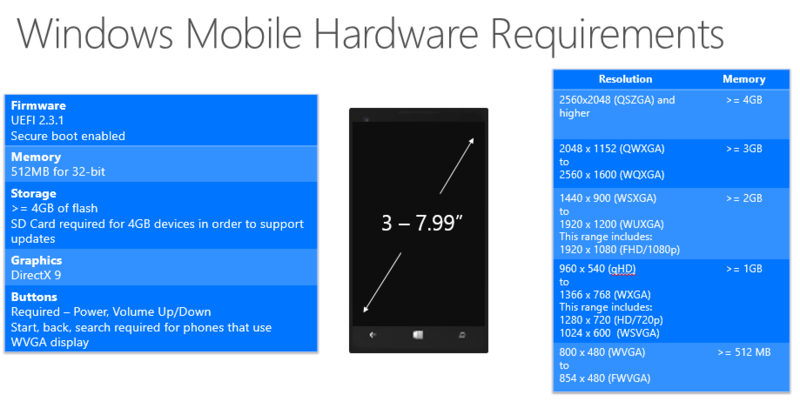 Unlike Windows Mobile 10, Windows Desktop 10 doesn’t have many requirements on other components and sensors. Those are optional and is good to have though. One obvious missing item in the system requirements of Windows 10 is CPU microprocessor. Welcome to the world of good enough computing, where most modern CPU will run any operating system and software application thrown at it finely. And Windows 10 does add new SoC processors support as listed below, which means even more devices can run or flash to Windows 10, even though it comes with other OS such as Android. In addition, specific requirements may also applies to certain features. For more info, check out http://www.microsoft.com/en-US/windows/windows-10-specifications. Windows 10 is expected to be launched in summer 2015.